The photon-counting Optical Time Domain Reflectometer or v-OTDR (v being the standard symbol for a photon), is a high dynamic-range, short distance OTDR. The v-OTDR enables the analysis of rather short optical networks (up to 40 km for single mode fibers, with measurements windows between 200 m and 800 m), with a very high spatial resolution (in the centimetre range). This type of measurement is completely impossible with a standard OTDR. 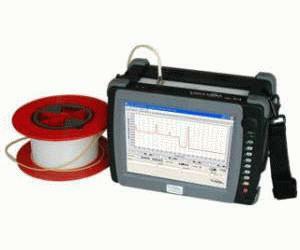 We offer several types of v-OTDRs, adapted to the fibres and wavelengths used by our customers. These include singlemode fibers, multimode fibres and plastic optical fibres, with standard wavelengths at 520 nm, 650 nm, 850 nm, 1310 nm, 1550 nm and 1620 nm. There can be up to 4 wavelengths in one single instrument, either in telecom windows or at shorter wavelengths. Since our v-OTDR is often custom-designed, do not hesitate to contact us to see if we can fulfill your requirements.